California Sen. Kamala Harris officially launched her 2020 presidential campaign at a Sunday rally in her hometown of Oakland, California. A huge crowd of twenty-thousand people turned out to hear her declare why she would be the best person to become the next president of the United States. Harris is the fourth woman to enter the race for the Democratic nomination. She joins New York Senator Kirsten Gillibrand, Massachusetts Senator Elizabeth Warren, and Hawaii Congresswoman Tulsi Gabbard. Harris, 54, was elected to the Senate in 2016. She previously served as San Francisco District Attorney and the state of California’s Attorney General. She was the first woman and first minority to hold those public offices. She is a proponent of universal health care and gun control legislation. 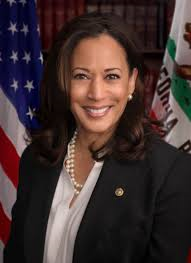 Harris is the daughter of a Jamaican father and East Indian mother who met while they were working in the civil rights movement. The day after Harris made her historic announcement, she began her campaign in Iowa where the first votes are cast for president almost exactly one year from now.